Writing the Story of Texas Edited by Patrick L. Cox and Kenneth E. Hendrickson Jr.
Edited by Patrick L. Cox and Kenneth E. Hendrickson Jr.
Luminaries in Texas history pay tribute to an all-star cast of thirteen historians—from J. Frank Dobie to Américo Paredes—who preserved Texas’s past, and who were often as colorful as the historical figures they studied. The history of the Lone Star state is a narrative dominated by larger-than-life personalities and often-contentious legends, presenting interesting challenges for historians. Perhaps for this reason, Texas has produced a cadre of revered historians who have had a significant impact on the preservation (some would argue creation) of our state’s past. An anthology of biographical essays, Writing the Story of Texas pays tribute to the scholars who shaped our understanding of Texas’s past and, ultimately, the Texan identity. Edited by esteemed historians Patrick Cox and Kenneth Hendrickson, this collection includes insightful, cross-generational examinations of pivotal individuals who interpreted our history. 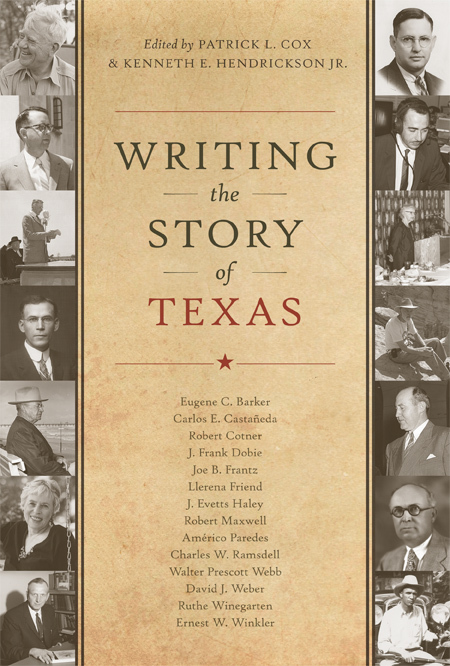 On these pages, the contributors chart the progression from Eugene C. Barker’s groundbreaking research to his public confrontations with Texas political leaders and his fellow historians. They look at Walter Prescott Webb’s fundamental, innovative vision as a promoter of the past and Ruthe Winegarten’s efforts to shine the spotlight on minorities and women who made history across the state. Other essayists explore Llerena Friend delving into an ambitious study of Sam Houston, Charles Ramsdell courageously addressing delicate issues such as racism and launching his controversial examination of Reconstruction in Texas, Robert Cotner—an Ohio-born product of the Ivy League—bringing a fresh perspective to the field, and Robert Maxwell engaged in early work in environmental history. Llerena Friend by Kenneth E. Hendrickson Jr.
Carlos Castañeda by Félix D. Almaráz Jr.
Patrick L. Cox is an author and public history consultant who previously served as Associate Director of the Dolph Briscoe Center for American History at the University of Texas at Austin. His previous books include The House Will Come to Order: How the Texas Speaker Became a National Power in State and National Politics . Kenneth E. Hendrickson, Jr., is Regents’ and Hardin Distinguished Professor of American History, Emeritus, at Midwestern State University. He is the author or editor of ten books, including Profiles in Power: Twentieth Century Texans in Washington , which he coedited with Patrick L. Cox and Michael L. Collins. Nearly a decade ago, several of my fellow Texas historians—Ken Hendrickson Jr., Light Cummins, Mike Collins, and Dan Utley—and I met for a cold drink and a discussion on a recurring topic among historians who reside in Texas. As we surveyed the landscape of historical literature and the significant contributors to the field, we came to the conclusion that someone should furnish a collection of essays on those who had provided outstanding contributions to the interpretation and writing of our history and how this has changed over time. Since we happened to have our discussion during the 2003 annual meeting of the Texas State Historical Association in El Paso, we dutifully concluded we should also base our survey on those who had roots in Texas—or who had at least spent a great deal of their professional careers between the Rio Grande and the Red River. In keeping with many other cultural and historic traditions, we toasted the idea and christened Ken Hendrickson and myself as the editors of this august undertaking. Whether this was the hot afternoon sun or the intoxicating idea of acknowledging some of our predecessors, we set about to make a selection of the dearly departed historians and to secure the services of some of our esteemed colleagues in this very worthwhile enterprise. As a result of this afternoon discussion in El Paso a number of years ago, Ken Hendrickson and I are pleased to announce that we have assembled a very distinguished list of Texas historians for this book. History and its interpretation is not a new profession. Recording and writing history dates to the ancient works by the great Greek and Roman historians Herodotus, Thucydides, Plutarch, and Tacitus. Oral tradition preceded written history and has been passed down and subsequently recorded. As centuries progressed and history became a more demanding study of people, events, culture, and analysis, those who chose to study and write about history reflected the times and eras in which they also lived. Even the most admired ancient historians had faults and biases that are reflected in their writings. Modern historians often studied and contemplated the writings of early historians as they began their own studies. A classical education was often a critical component of the education curriculum in the modern age. Just as with the earliest historians, contemporary ideas and prejudices penetrate the work of even the most scholarly authors of history to this day. A large gap, both chronological and theoretical, exists between the classical approach to history and the modern era of historical research, writing, and interpretation. For most people today, historians serve as the mediators between current generations and the past. Historians strive to present our past based on factual evidence collected from our history. In order to offer an understanding of past events, they devise explanations that include interpretation and analysis. Without interpretation, history becomes nothing more than a long uninterrupted litany of unrelated stories—not unlike many family holiday gatherings. Along with this perspective (which some may appropriately call bias) and interpretation, historians also provide a narrative and sometimes a visual context for relating the past. They bring a sense of order and understanding to events and people that may on the surface appear to be unimportant or disconnected. Historical studies and perspectives also change over time. Each generation is influenced by a number of factors that are reflected in our histories. For example, American "exceptionalism," how we and those in other nations and cultures view our history, is one of the constant themes throughout our history. Over the past century American historians have been influenced by the culture in which they lived, the education they obtained, and the influence of their peers who study history. Furthermore, more materials for research continue to become available. For example, newly discovered correspondence, government archives that are unsealed, oral histories, and many other primary sources allow historians to refine their perspectives and subsequent generations of historians to depart from established viewpoints and beliefs. This is what brings meaning to history. It is also a reflection of how historians are just as fallible as politicians, doctors, military and business leaders, and other social icons who succumb to poor judgment and suspect conclusions. In keeping with these themes, we selected a group of historians from the nineteenth through the twentieth centuries who were connected with Texas and provided substantive contributions to the profession and our history. Texas and the greater borderlands region is the focus of their histories. They each offered new historical perspectives and interpretations, not just from a regional standpoint but also from the broader perspective of our national and cultural history. As stated earlier, source materials, perspectives, critical studies, ideology, and interpretation evolve over time. We believe that each of the historians selected for this volume illustrates how professional historians approach their selected topics. In addition, each selected historian provided his or her own unique influence in a broader context through teaching, civic involvement, and sometimes involvement in controversial events. In doing so, they also became part of the historical record. In each of the essays on the chosen historians, we asked our contributors to develop a biographical sketch of the individual and the environment in which he or she lived, and to recognize the subject's significant research and publications, noteworthy achievements, and contributions to the profession and to general knowledge about history. The authors also cover major public controversies or other disputes in which these historians were involved during their professional careers. They examine how their theories and impact have fared over time and how contemporary historians view them; in some cases, they place their subjects in the context of ongoing or emerging debates. Each article is written by acknowledged experts and extensively documented. In making our selection, we cast a broad net to include both professional historians and others who contributed to the historical literature of the borderlands region. Thus we include folklorists, oral historians, and others who chose to look beyond the traditional borders of history. Anglo Texans of the late nineteenth and early twentieth centuries had their roots and education in southern, not western, culture. Later historians of the twentieth century moved beyond the traditional male, southern culture to relate a more inclusive story of gender, ethnicity, and the cultural environment. Historians of later generations realized that not only the deeds of a few great men influenced our past; many others who did not possess fame and fortune provided notable contributions with significant results. All of the selected men and women historians on this list provided noteworthy publications and ideas for their generation and for those who followed. Their understanding of history along with human attributes and foibles provided great drama and tension. They also understood that progress, whether in the realm of democratic ideas, economic gain, or social justice, is never a predetermined or foreordained outcome. Some were more cynical than others. Yet all were taken with the idea of historical change and significance. In addition, these men and women were, and still are, considered accomplished writers who share a narrative that will still engage the modern reader in the Internet age. In many ways, we historians are a metaphor for the Texas weather—constantly changing, often turbulent, frequently unpredictable, yet often beautiful and inspiring. Our readers will note that the majority of historians in this volume were associated with the University of Texas. Many of the early professional historians of the late nineteenth and early twentieth centuries maintained ties to the university in Austin for several reasons, including financial support and the existence of research archives and professional historical associations. The Texas State Historical Association (TSHA), founded in 1897 at the University of Texas, received much of its early support from that institution. For more than a century, members of the University of Texas history department worked closely with this association and other organizations throughout the state to further the study of Texas, the American South, and the borderlands region. As the profession expanded along with a growing population during the twentieth century, new generations of historians not directly connected to the University of Texas began to make their mark. This study reflects that change both in the locus of interest of historical study and the broader perspectives and interpretations that newer generations of historians offered. Nationally recognized regional and borderlands history programs and publishing outlets exist today at universities and colleges throughout the state, such as Texas Tech University, Texas State University, Texas Christian University, the University of Houston, North Texas University, Southern Methodist University, Angelo State University, Midwestern University, Stephen F. Austin State University, Sam Houston State University, Austin College, Trinity University, Southwestern University, and several others. Notably, the TSHA relocated to North Texas University on the main campus in Denton in 2008. Many other regional and local historical associations are located throughout the state and affiliated with local colleges and universities. In choosing the deceased historians and folklorists for this list, we had to make difficult decisions, and we should note that many others who provided significant contributions could have been included. In addition, many current historians who are very much alive and producing outstanding research and publications will also one day merit a place on the roll of honor. For the purposes of this publication, we chose to begin with a select group of individuals who provided groundbreaking research along with a unique approach to relating the history of the region and its people. We also wanted to select individuals who could provide a compelling story for the reader, both at the academic level and at the level of reading history for personal insight. Not everyone can contribute solid research, coherent interpretation, and an appealing story; we believe that the historians we have selected meet these high standards. Thankfully, we also have an outstanding group of contemporary historians who furnished these insightful, engaging essays and, as an added bonus, lists of recommended readings, which will allow readers to engage with some of the seminal works by the historians chosen for this book. We offer these essays to the reader in chronological order. The early professional historians—Charles Ramsdell, Eugene C. Barker, Walter Prescott Webb, and Earnest W. Winkler—represent the professional historians who set the first modern standard for historical works. The second generation, in the mid-twentieth century—Llerena Friend, J. Frank Dobie, J. Evetts Haley, Robert Maxwell, Carlos Castañeda, and Robert Cotner—provided new interpretations, sources, and methods. The generation of historians in the modern, post–World War II era reflect expanded research, cultural diversity, and challenges to the histories provided by earlier generations. The final essays on Américo Paredes, Joe Frantz, Ruthe Winegarten, and David Weber illustrate the changing interpretation and telling of our history. We hope you enjoy this presentation of insights into these unique and impressive historians.